EAA Vintage Aircraft Association > Outstanding Flights > OUTSTANDING FLIGHTS: Columbia Gem of the Ocean! OUTSTANDING FLIGHTS: Columbia Gem of the Ocean! 1930—New York to Bermuda non-stop and return, pilots Capt. J. Erroll Boyd and Roger O. Williams with navigator Lieut. Harry O. Conner, U.S.N.R.. The amazing Columbia compiled an enviable record of long distance flights in just a few years and could easily have won the New York to Paris $25,000.00 Orteig prize. It was only the questionable decisions that preceded the flight that prevented the Columbia from winning the prize and capturing the fame, fortune and world–wide recognition that Charles Lindbergh achieved. In 1926 Bellanca joined the Wright Aeronautical Corp. as a consultant. While there he designed two aircraft, the WB-1 and WB-2, which later was named the Columbia. It was here that Bellanca and Clarence Chamberlin developed a close relationship. 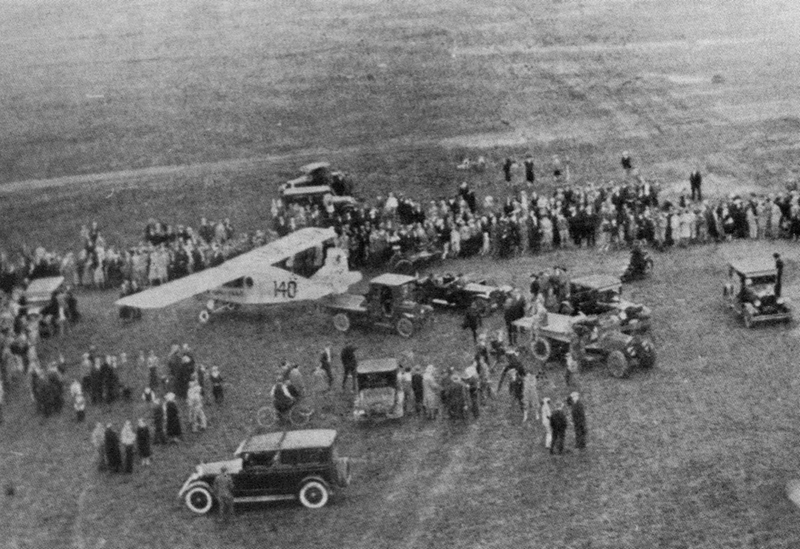 Unfortunately for the two, the Wright organization decided to concentrate only on engine manufacturing, so Bellanca and investor Charles Levine established the Columbia Aircraft Co. One of their early achievements was on April 12, 1927 when Clarence Chamberlin and Bert Acosta took off in the WB-2 and stayed aloft for 54 hours and 30 minutes flying an estimated 4,100 miles—a record endurance flight! More than enough range to win the NY to Paris prize! But then legal and personality problems arose in the Levine camp which created complications and delays. At one point Charles Lindbergh made an offer to buy the WB-2, but was turned down and also was not acceptable as a pilot for the WB-2. It was during this period that the WB-2 was christened “Columbia” by Levine’s 9 year old daughter. It was following the christening of the aircraft that Chamberlin showed his remarkable airmanship when he took Levine’s daughter and her friend for a flight and on take-off a bolt sheared off the left landing gear causing the gear to sag below the fuselage. Chamberlin skillfully brought the aircraft to a safe landing with little damage to the aircraft. In the meantime Lindberg was in San Diego with the Ryan Airlines organization designing and building the Spirit of St. Louis. Amazingly the aircraft was completed within three months. And May 20-21, 1927 Lindbergh flew the Spirit of St. Louis non-stop New York to Paris to win the Orteig prize and win international immortality! 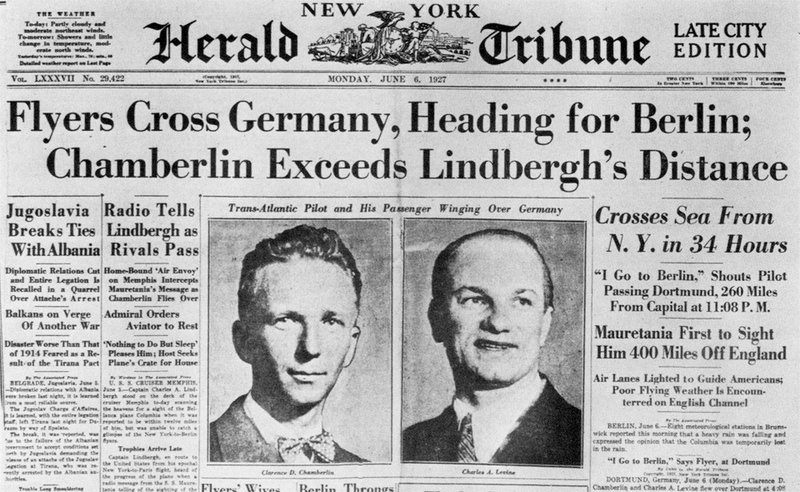 Only 15 days after Lindbergh’s flight Chamberlin and Levine took off with a target goal of reaching Berlin, Germany. 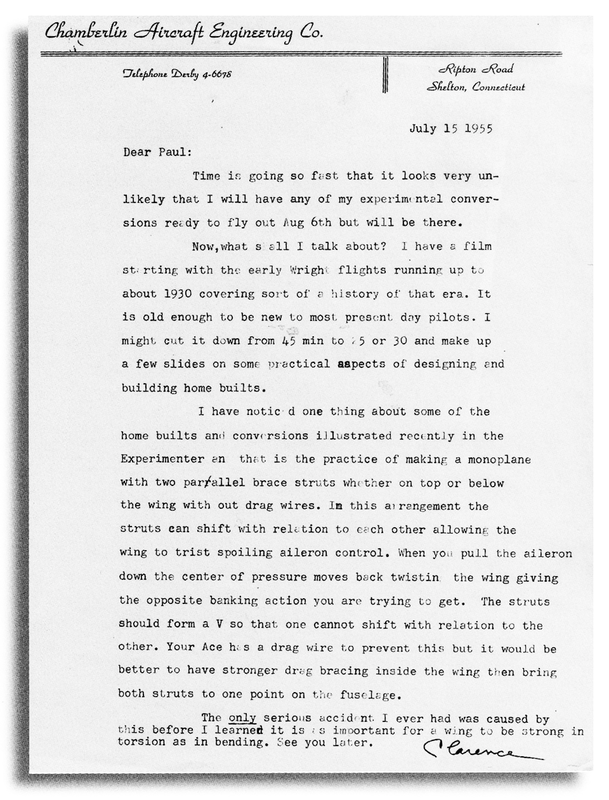 The following article by Phillip C. Brown is the result of an interview with Clarence Chamberlin, the pilot who made the Atlantic flight. Mention 1927 and most aviation enthusiasts will recall. “Ah yes, that was the year of Lindbergh’s famous flight to Paris.” Yet, in this year which marked the dawn of the golden age of aviation, no less than 21 major attempts were made to bridge this great ocean expanse first crossed (non-stop) by Capt. John Alcock and Lt. Arthur W. Brown on June 14-15, 1919. Spurred on by the promise of fame and the $25,000 prize of­fered by Raymond Orteig for the first non-stop flight between New York and Paris or “the shores of France,” 19 people met their deaths in ill-fated attempts during this year. Noel Davis and Stanton Wooster crashed to their deaths in a test flight of their Keystone Pathfinder at Langley Field in Virginia on April 26th, and the famed French aviators, Charles Nungesser and Francois Coli left Le Bourget on May 8th, never to be seen again. Yet men such as the famed Arctic explorer Richard Byrd and a little-known airmail pilot, Charles Augustus Lind­bergh, persisted in their dreams to bridge this vast untram­meled space over the ocean and thus claim the prize that had first been offered by Orteig in 1919. Orteig, an emigre Frenchman who owned the Lafayette and Brevoort Hotels in New York, was eager to ensure that France had a role in the conquest of the Atlantic and had made his initial prize offering in 1919 for a non-stop flight between New York and Paris within a period of five years. When the prize went unclaimed, he renewed his offer in June of 1925. Clarence Chamberlin posing in front of the 200 hp J-5 Wright Whirlwind powered Bellanca WB-2 that took off April 12, 1927 and flew for a record-setting 4000 mile, 51 hour, 11 minute flight circling over Long Island, New York. Along with everlasting fame, Lindbergh was the recipi­ent of this prize when he made his famed flight on May 20- 21, 1927. Yet, but for unbelievable legal entanglements and bickering between a wealthy financial backer and a succes­sion of would-be crew members, the “Columbia” of Charles A. Levine, which flew from Roosevelt Field, Long Island to Eisleben, Germany, a distance of 3,911 miles on June 4-6, might well have claimed this distinction and the immortal­ity that accompanied it. The story of the flight of Clarence Chamberlin and Charles Levine in their Wright-Bellanca monoplane, the “Columbia”, is one of the most interesting sagas of this era. Charles Levine was a 28-year-old millionaire who had made his fortune dealing in war surplus materials. With an inter­est in aviation, he had taken flying lessons in a “Jenny” from Bert Acosta. As a money man and promoter, he became the backer of the Columbia Aircraft Corporation, formed when famed aircraft designer Giuseppe Mario Bellanca left the Wright Corporation. To this corporation, along with Bellanca, came a WB-2 (Wright-Bellanca) monoplane powered by a 200 horsepower Wright Whirlwind engine, that had been built in 1926 and which had captured the Detroit Trophy at the Na­tional Air Races in Philadelphia during that same year. The WB-2 had a span of 46 feet, six inches; a length of 26 feet, nine inches and a wing area of 272 square feet. While Levine, as an astute promoter, entertained visions of flying the Atlantic, he was not averse to selling the air­craft if the proper opportunity presented itself. Therefore, he actually had dealings with Lindbergh when the young airman from St. Louis was seeking a suitable plane for his proposed flight. However, the negotiations failed and, as Lindbergh turned to the Ryan Airline Company for his famed “Spirit of St. Louis”, Levine began assembling the cast of would-be ocean fliers that would wander in and out of his plans for the next few months. His first choice of pilots was Leigh Wade, who had gained some measure of renown as the pilot of the “Boston” in the U.S. Army ‘s round-the-world flight in 1924. With his sense of publicity and the knowledge that after a successful flight, considerable picture-taking and public appearances would take place, Levine placed great importance on assembling a tall, handsome, and photogenic crew. The designer, Bel­lanca, had no such concern for the cosmetic attributes of the fliers, but insisted that one of the aviators should be 32-year-old Clarence Chamberlin, a relatively short and slender former Army pilot and barnstormer who had served as a test pilot for Wright and who now found himself associated with the Columbia Aircraft Corporation. There was no doubt that Chamberlin was the best qualified man for the job due to his close association with the plane, and Bellanca was adamant in the matter of his inclusion. However, when Wade began searching for a bigger name pilot to replace Chamberlin and started talking about bring­ing in his own manager and publicist, Levine sensed a threat to his authority, forced Wade’s resignation which took place on April 8th, and brought in well-known Bert Acosta, the winner of the 1921 Pulitzer Air Race. Refueling the Bellanca in preparation for an attempt to set a non-refueling endurance record of 50 hours before attempting a trans-Atlantic flight. Clarence Chamberlin and Bert Acosta were successful in setting the record. At 9:34 on the morning of April 12, 1927, Chamberlin and Acosta took off from Roosevelt Field on Long Island and re­mained aloft for 51 hours, 11 minutes and 25 seconds to establish a new world’s endurance record, beating the for­mer record of 45 hours, 11 minutes and 59 seconds that had been set by two Frenchmen, Drouhin and Landry in June of 1925. During the latter portion of the flight of the “Colum­bia”, the Wright engine had been throttled back to 1,000 rpm’s and was only consuming five gallons of fuel per hour. The “Columbia” had covered approximately 4,000 miles as it shuttled back and forth over Long Island. The “Columbia” was clearly capable of the task that lay before it. Levine still felt that a qualified navigator should serve on the crew. To these ends, he now enlisted the services of Lloyd W. Bertaud, a famed air mail pilot. Levine let it be known that the choice between Chamberlin and Acosta would be made by the random draw of a slip of paper from a hat on the day of the flight. Privately, Chamberlin felt that his own slender and unimposing appearance would favor the selection of Acosta and Bertaud. 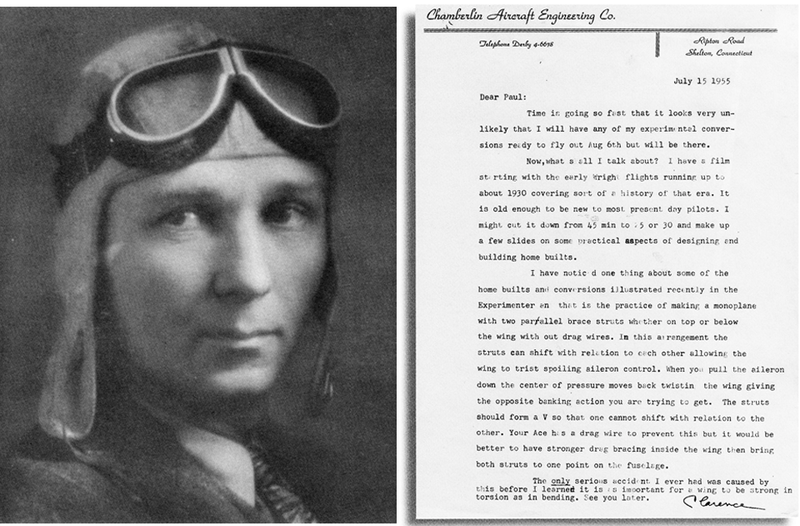 As the days of April slipped by, outsider Charles Lind­bergh’s chances of getting into the “Great Air Derby” were looking increasingly brighter as the “Spirit of St. Louis” neared completion in Ryan’s San Diego factory. Richard Byrd’s entry, the tri-motored Fokker, “America,” sponsored by Rodman Wanamaker, had come to grief in a near-disas­trous crash on April 16th on its first test flight. With designer Fokker in the left seat, co-pilot Floyd Bennett in the right, and Byrd and engineer George Neville, former head of the Air Mail Service aboard, the craft proved to be nose heavy and flipped over on its back upon landing at Teterboro Field in New Jersey. Fokker was practically unhurt but Byrd suf­fered a broken left arm. Neville had torn stomach muscles and internal injuries, and Bennett had a compound fracture of his right leg which would take weeks to mend. Byrd esti­mated that it would take a month of intensive work to put the aircraft in shape again. Meanwhile, April 24th was chosen as the date of the chris­tening of the “Columbia” by Levine’s nine-year-old daughter, Eloyse. A bottle of ginger ale was employed for this task, for Prohibition was in full swing at this time. Shortly after four o’clock, as the ceremonies were concluded, Eloyse Levine asked if she and her fifteen-year-old friend, Grace Jonas, the daughter of the president of the Brooklyn Chamber of Com­merce, could be taken up for a ride. With the two girls and mechanic John Carisi aboard, Chamberlin took off in the newly christened “Columbia.” As the plane left the ground, a bolt sheared in a shock absorber and, unknown to the pi­lot, the left landing gear sagged helplessly beneath the air­ craft. Another pilot, Dean Smith, raced to his plane and, with a mechanic clutching a small wheel taken from a dolly in the hangar, took off in pursuit. Slipping up alongside the “Co­lumbia,” the mechanic gestured frantically with the wheel until he was successful in making Chamberlin aware of his predicament. Chamberlin later recalled that they wanted him to land at Mitchell Field where they had better crash equip­ment, but he wasn’t worried about having to land on one wheel, so he returned to Roosevelt Field, thus avoiding hav­ing to take the plane apart. Chamberlin’s skillful landing on one wheel saved the airplane. Although pressure was thus brought to bear on Levine to name Chamberlin to crew after his dramatic demonstration of his airmanship, Levine would not alter his previous stand. How­ever, a few days later Acosta, tired of the constant bickering, submitted his resignation, clearing the way for Chamberlin. While the Brooklyn Chamber of Commerce had offered a further inducement to the “oceanfliers” in the form of a prize of $15,000 to supplement the Orteig sum, the “Columbia” seemed no closer than ever to capturing these prizes. Levine and Bertaud had become embroiled in a battle over arrange­ments the latter had made to sell his story to a news service. Faced with a Levine ultimatum, Bertaud was forced to can­cel his private arrangements to remain in consideration for inclusion in the crew. Levine then came forth with a contract for both Cham­berlin and Bertaud. Each were to receive $150 per week for a year after the flight during which time Levine would act as manager of whatever publicity appearances he could ar­range. If earning were sufficiently large, Levine could grant such bonuses as he saw fit. In addition, Levine would get half of the prize money. There was no provision for insur­ance for the wives of the crew. Regardless of their personal thoughts on the terms, both men, anxious to be under way, signed the contracts. Chamberlin’s thoughts were that he would rather fly first and fight later. Hauling out Columbia for the start of the trans-Atlantic flight. Then, with bad weather delaying the start of the flight, Bertaud pondered this contract and obtained a promise of better terms from Levine. When this promised contract was not forthcoming, Bertaud had his lawyer obtain an injunction which restrained Levine and the “Columbia” from making any flight to Paris without Bertaud. Ironically, only Levine’s superstitions had prevented the flight from leaving on Friday, May 13th. Now, one week later with the fate of the “Colum­bia” enmeshed in legal entanglements, the crew could only watch as Lindbergh took off for Paris. When the injunction was dismissed by the court, Bertaud was summarily released, leaving only Chamberlin in the Levine camp. Lindbergh had reached Paris and a disgusted Giuseppe Bellanca washed his hands of all connection with the flight. His name on the rudder was painted over and where the legend, “New York to Paris” had adorned the side of the aircraft, the word “Paris” was replaced by an arrow signifying an indefinite destination. 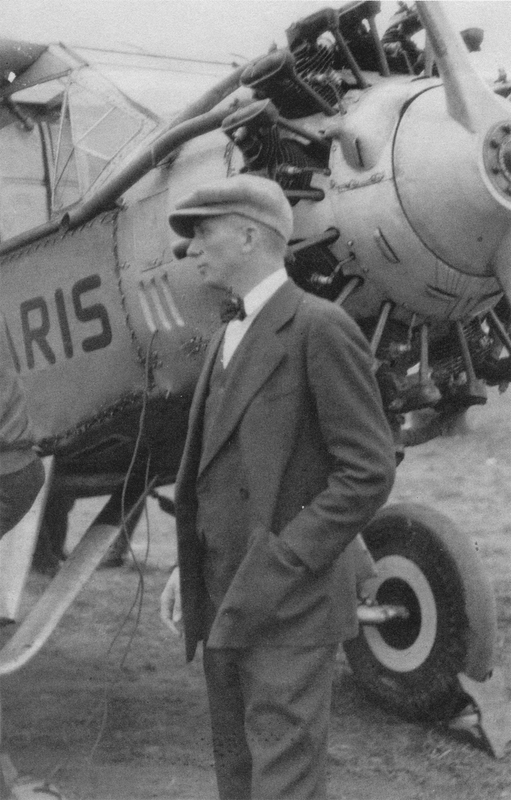 Chamberlin had wanted to be the first to fly to France, of course, but was no less determined to successfully complete the flight, flying further than Lind­bergh if possible, and proving that he could have been first except for the unbelievable squabbling and bickering. At about this time Levine started thinking about occupy­ing the second seat himself. Chamberlin had always felt that a navigator was unnecessary and Levine, with his penchant for joy riding, had several hours of stick time in the “Colum­bia” and could relieve at the controls once they were in flight. However, he kept his ambitions hidden, particularly from his wife who had threatened to burn the craft if she suspected that he might have any ideas of going on such a jaunt. 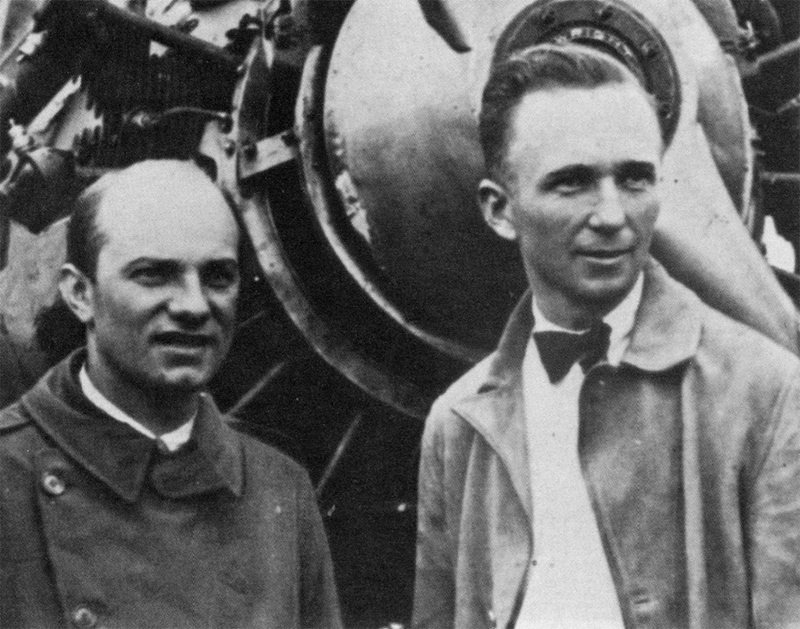 Clarence Chamberlin with Charles S. Levine who at the last moment climbed into the right seat to serve as an unlikely crew member on this history-making trans-Atlantic flight. Finally, on June 3rd, the weather map over the Atlantic looked promising. Richard Byrd had generously offered the use of Roosevelt Field with its longer and better prepared run­way and Chamberlin arrived there by five in the morning of June 4th. Charles and Grace Levine arrived at about the same time; Levine dressed in an ordinary business suit. Chamberlin was clad in a leather jacket, knickers, and colorful golf stock­ings. Levine announced to all who inquired, that an anony­mous navigator would be boarding just before takeoff. 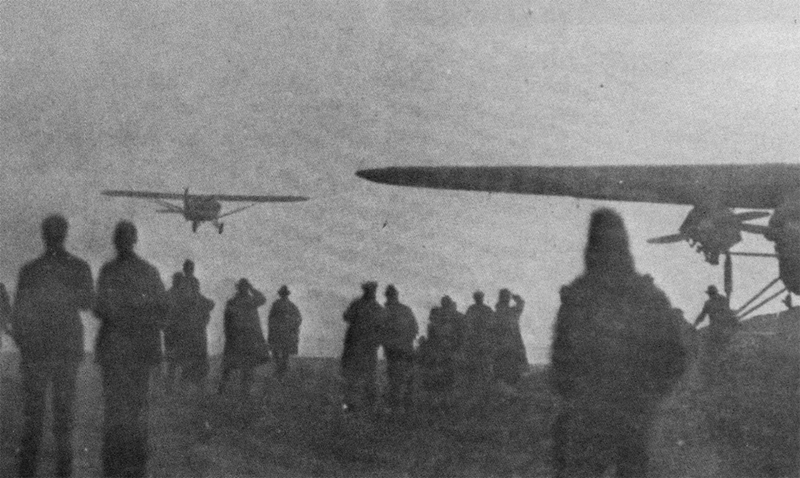 Levine climbed aboard as Chamberlin warmed up the engine and ran the “Columbia” down the runway and back to the starting point. By then mechanic John Carisi realized what was about to happen. He leaped atop the right wheel and began arguing furiously with Levine as the police strug­gled to clear the takeoff path. Carisi’s protests were swept away in a cloud of dust as Chamberlin opened the throttle toppling Carisi from his perch. The “Columbia” swerved and jolted down the runway and as the realization of her husband’s intentions struck Grace Levine, she fainted into the arms of a Nassau County policeman. At exactly 6:04 AM the Columbia lifted from the ground. After weeks of unnecessary wrangling, the Columbia was on its way to Europe. 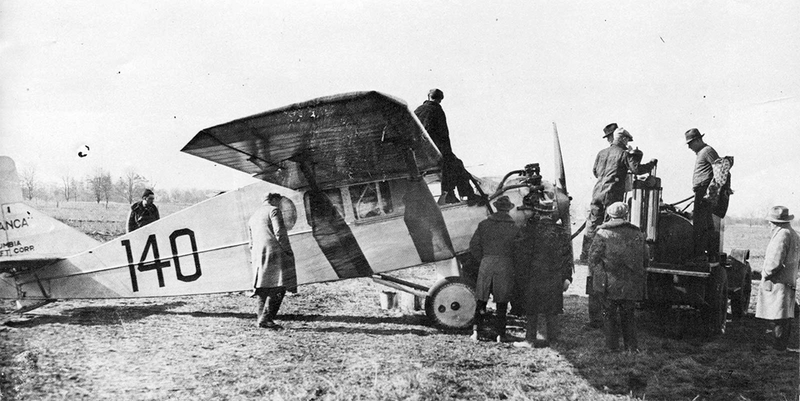 Chamberlin climbing aboard for the trans-Atlantic flight. New York—Paris originally appeared on the fuselage sides but Paris was painted over following news of Lindbergh reachjng Paris. It was believed that G.M. Bellanca, in disgust did this, also removing the name Bellanca from the rudder. As the Bellanca-designed monoplane was passing over Byrd’s ship, the “America,” at the far end of Roosevelt Field, Chamberlin throttled the Wright engine back from 1,750 rpms to 1,700 and slowly gained altitude with his load of 450 gallons of fuel. Their announced destination was Berlin although they planned to fly as far as their fuel would allow. Empty, the Bellanca weighed 1,850 pounds. Now, loaded for her epic journey, her gross weight was 5,418 pounds. Over Long Island Sound, the Columbia had reached 700 or 800 feet and Chamberlin backed off further to 1,650 rpm’s. He now had time to reflect on the fact that he was perhaps fortunate to have his wealthy backer along with him for he had only $11.14 tucked away in his knickers. Troubles were not long in becoming apparent however. By the time they had crossed the Sound to New London, Con­necticut, they were far enough off course to cause alarm. Crossing over Cape Cod, it became apparent that the earth­ inductor compass for which Levine had paid $1,125 had only lasted for about 200 miles and that they were left with a simple and not too precise magnetic compass. For a moment, Chamberlin considered turning back but he realized that Levine would probably never get the chance to go again and that all dreams of a trans-Atlantic flight would end. He explained the situation to Levine who said, “Go ahead, I’d rather be in Davy Jones’ locker than have to go back and face those newspaper men”, probably also reflecting on the ire of one Mrs. Grace Levine. The actual takeoff from Roosevelt field, May 20, 1927 with Chamberlin and Levine lifting the fuel heavy 5,418 lb. gross weight of the Bellanca from the runway headed for Long Island Sound and a flight that made aviation history and the pilots gained international fame. Continuing over water from Cape Cod to Nova Scotia, they hit their landfall “on the nose” and their morale took an upward leap. The weather had been ideal and they had slipped into flying clothes that had been placed on board earlier. 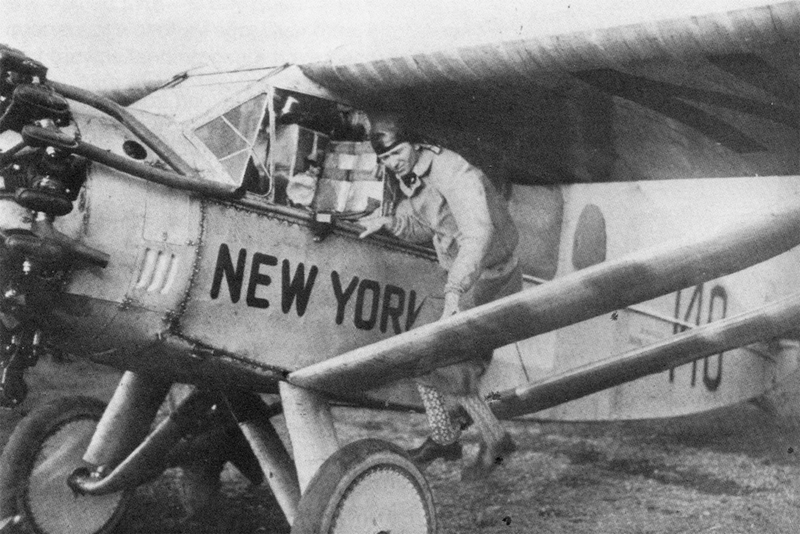 Their other provisions included a Very pistol with flares, a rubber life raft, a flashlight, two vacuum bottles of chicken soup and one of coffee, ten chicken sandwiches, a half dozen oranges, two canteens of water, Army emer­gency rations, chewing gum, extra flying clothes for use at night, and both lightweight cloth and heavy fleece-lined fly­ing helmets. Chamberlin had not bothered to include oars for the raft, realizing that if the use of the raft was necessary, they would probably be too far from land for the oars to be of any value. The only item that was misplaced was a map of Germany. Behind the seat was a fuel tank atop of which one could stretch out and unlimber cramped muscles. It was in this connection that Levine’s ability to fly the plane contrib­uted so much to the success of the flight, allowing Chamberlin to get some much-deserved rest. Perhaps Chamberlin now had time to reflect on his back­ground that had led up to this flight. He had been born in Denison, Iowa on November 11, 1893. During World War I he had enlisted, won his wings and was in Hoboken, New Jersey, waiting to sail overseas on November 11, 1918 (his birthday), when the armistice was signed. He says this was the best possible birthday present, as they would have been shot out of the skies by the Germans, not even having flown fighters in this country! For a while he remained in the Army, having been mar­ried on January 3, 1919, but finally resigned to begin the life of barnstorming undertaken by so many of the early fliers. Teterboro Airport in New Jersey was little more than a swamp when he made it his base of operations in the early twenties, continuing to eke out an existence by giving rides and modi­fying war surplus planes whose sale kept the wolf from his door. In these enterprises he was joined by Basil Rowe who later became one of Pan American Airway ‘s first pilots and who, along with Charles Lindbergh, pioneered many of Pan Am’s routes. Chamberlin had survived a serious crash at the National Air Races at Mitchell Field in 1925 in which his pas­senger was killed and he was seriously injured. At about this time he formed the association with Giuseppe Bellanca that had brought him to his present circumstances, striking out over the Atlantic through the darkness of night. As day broke, they began spotting ships below. The third of these was the liner Mauretania which they circled, allow­ing their position to be relayed to shore. Chamberlin then en­gaged a bit of unique position fixing. He pulled out a copy of the New York Times and noted that the Mauretania had left Cherbourg the day before and estimated that its present po­sition would be 350 miles from France. Flying ahead of the liner, Chamberlin turned and lined up the stacks of the great ship. Noting his compass heading, Chamberlin resumed his flight, confident that his new heading would carry him to the shores of France. About thirty minutes later they spotted the U.S. Cruiser Memphis which they knew was carrying Lind­bergh back to a tumultuous welcome in America. Feeling that they had already exhausted enough fuel flying around ships, Chamberlin vetoed Levine’s desire to “jazz her up” and continued their eastward journey. Columbia headed out over the ocean laden with 450 galloons of fuel for the 200 hp J-5 Wright Whirlwind engine. By midnight of their second day, they had flown over Lands End, passed over Plymouth at 9:10 PM, crossed the English Channel, and were entering some thick weather over the Continent. Even climbing to 21,000 feet failed to clear the wall of clouds that blocked their passage. The summer dawn comes early in these latitudes and Chamberlin elected to hold west of this barrier and continue in daylight. Turn­ing the controls over to Levine, he slipped back onto the fuel tank for a rest. It was now June 6th, 1927, their third day since leaving New York. Not knowing the elevation of the terrain beneath the grey clouds that enveloped them, they cautiously edged lower. Between 500 and 1,000 feet they broke out into the clear and found themselves over Dortmund, Germany. Now Chamberlin wished that he could locate the errant map of Germany. Although their fuel supply was becoming meager, they felt that they could find a city the size of Berlin by sim­ply pressing on to the southeast. Chamberlin wanted to land while some fuel remained but Levine wanted to fly until the last drop of gas was exhausted. “O.K., it’s your airplane,” said Chamberlin as they resumed the search for Berlin, but privately he thought that it would be a shame to bend up such a plane to simply gain four or five extra miles. At last, the sputtering of the engine told them that they had come as far as they could. Chamberlin picked out a likely looking field, and as the prop came to a stop, landed the “Columbia” in a wheat field, ground looping to avoid a fence at the end. They had come to earth at Mansfeldt, near Eisleben, about 108 miles short of their goal. It was a few minutes after six o’clock in the morning of June 6th and they had flown 3,911 miles in 43 hours. They had beaten Lind­bergh’s record of two weeks by 295 miles. Unlike today, aviation related events gardnered front page coverage in the 1920s and 30s as this New York Herald Tribune edition informed readers as the flight progressed over Europe. 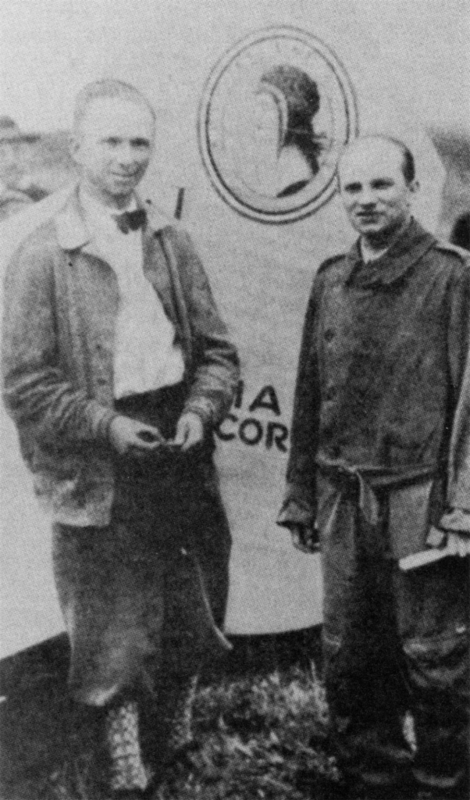 Clarence Chamberlin and Charles Levine at the end of their 3,911 mile flight from New York to Mansfeldt, Germany (near Eisleben) was made in 43 hours and just 108 miles short of their Berlin goal. On the afternoon of June 7th, after an intermediate stop at Cottbus, the Columbia arrived at Templehof Field to the wild acclaim of 150,000 Germans. Then began an extensive round of receptions and public appearances. They visited Frankfurt, Vienna, Karlsruhe, Stuttgart and Hanover. They met President Von Hindenburg and were given a tour of the Zeppelin Works by Dr. Hugo Eckner. Mrs. Levine and Mrs. Chamberlin sailed on the Bremen to join their husbands in Bremerhaven and the foursome resumed their triumphant tour. Together they visited Budapest, Prague, Warsaw, Berne, Zurich and Paris. While in Paris they had the opportunity to visit the mother of the ill-fated Charles Nungesser and to greet Richard Byrd, Bert Acosta, Bernt Balchen and George Noville who had left Roosevelt Field on June 29th and had landed in the sea off the coast of France on July 1st in the “America” when they were unable to locate Paris beneath a heavy fog. On Friday, July 8th, Levine and Chamberlin, along with Maurice Drouhin, Levine’s recently engaged French pilot, flew the Columbia from Le Bourget to Croydon, the airdrome outside of London. A few days later Chamberlin and his wife sailed on the Leviathan and were joined in Cherbourg by Byrd and his party. On July 18th they were afforded one of the ticker tape parades for which New York is famous. 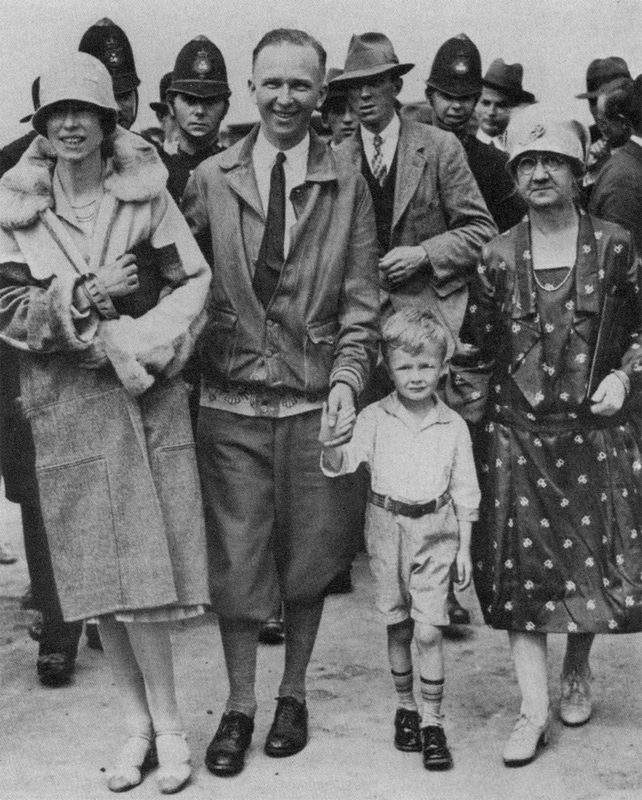 Clarence Chamberllin with his wife, mother and nephew at Croydon Aerodrome in England. Again, Levine and a pilot had become embroiled in a legal battle, Drouhin having obtained an injunction which prohib­ited the Columbia from being flown by anyone except him­self, as provided for in his contract with Levine. However, time was running out for Levine. He was sum­moned back to the United States by the government in con­nection with a claim it had placed against him regarding one of his surplus material deals. He and the Columbia returned to New York aboard a ship. Levine settled the government claim out of court for $150,000. He then lent out the Columbia for other distance flights. With Wilmer Stultz and Oliver Le Boutillier piloting the Columbia, Mable Boll made the first non-stop flight by a woman from New York to Havana, Cuba. Along with Miss Boll and Bert Acosta, Levine wanted to make the first non-stop east-to-west crossing in 1928. Levine had damaged the Columbia when he struck a fence during a landing so the trio went to France to shop for a new aircraft. While they were looking about for a suitable airplane for the trip, a German crew made the east-to-west crossing. Eventually, the Levine flight fizzled out in another legal battle in September of 1928. The Columbia, however, enjoyed a few more days of glory. In 1930, it was leased by Levine to J. Errol Boyd and Harry P. Connor, renamed the “Maple Leaf”, and became the first aircraft to make the Atlantic crossing twice when it flew from Harbour Grace, Newfoundland to the Scilly Islands of Eng­land on October 9-10. Levine sold the aircraft in 1931 and it was destroyed in a hangar fire in 1935. What of the fate of the principals of this drama? Sev­eral of them were destined to be claimed by the cold wa­ters of the north Atlantic. Lloyd Bertaud, who was to have been Chamberlin’s navigator, was lost in the Fokker, “Old Glory” which disappeared on September 6, 1927, after tak­ing off from Old Orchard, Maine. Walter Hinchliffe was lost on March 13, 1928 in a Stinson, the “Endeavor” which left from Cranwell, England. Maurice Drouhin was killed on Au­gust 8, 1928, when he crashed while taking off from Orly, France on a trans-Atlantic attempt. The others continued to write aviation history. Bert Acosta, who held so many early records, went to Spain in 1937 to fly a bomber for the Loyalists. He died in Denver on September 1, 1954, at the age of 59 after a two-year illness. Bernt Bal­chen, who piloted Byrd over the South Pole in 1928, became recognized as the world’s greatest arctic pilot. Balchen died on October 18, 1973. Basil Rowe, Chamberlin’s early busi­ness associate and a retired Pan Am pioneer, died in Mi­ami just ten days later. Dean C. Smith, who had come to the aid of Chamberlin’s stricken ship over Long Island when the landing gear failed, also served as a pilot on the Byrd expe­dition to Antarctica in 1928. On December 14, 1974, Leigh Wade, now a Major Gen­eral, was inducted into the Aviation Hall of Fame at Dayton, Ohio. John Carisi, Chamberlin’s mechanic, enjoyed a long career with Republic Aviation, retiring in 1955. He passed away at his home in Brooklyn on February 21, 1960, at the age of 75. Giuseppe Bellanca, who had come to this coun­try in 1911, became a citizen in 1928. He continued turning out planes that carried his name to glory. It was in a Bellanca that Clyde Pangborn and Hugh Hendon, Jr. made the first non-stop crossing of the Pacific in October of 1931 when they flew 4,458 miles from Tokyo to Wenatchee, Washing­ ton. It had been Bellanca who, while running a flying school in Mineola, Long Island prior to World War I, had taught a young man named Fiorello LaGuardia to fly. Bellanca died of leukemia on December 26, 1960 at age 74. It is the rare courage and determination of such men as Chamberlin that has earned them their well-deserved place in aviation history. Across the vast and unforgiving ocean, they dared to be first. of AVIATION QUARTERLY, Air Trails, Inc. Publisher). Click on the image above to read a larger version of the letter.